In the Dirt: Damon to the DL? 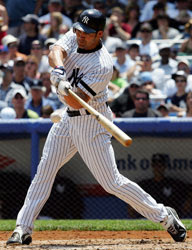 Yankees leadoff hitter Johnny Damon was not in the starting lineup last night and may not be at all in the immediate future. Damon who has played 12 of the last 13 games as the team’s DH due to sore calves is now suffering from an abdominal injury he sustained while taking batting practice last Tuesday at Yankee Stadium. Even though he has played through it up to this point he now thinks it might mean his first trip to the DL for his career. This recent development is bad news for the Yankees as they are already scrambling to fill-out their lineup. Yesterday the team designated Josh Phelps for assignment and will now be using Andy Phillips, who is a career .227 hitter, everyday at first. This still leaves the DH position wide open though it will likely be filled by Hideki Matsui which means you’ll be seeing rookie Kevin Thompson in left field. Thompson was batting .282 with 2 homeruns and 20 RBI’s this season with AAA affiliate Scranton and is a career .289 hitter in just 38 big league at bats. To fill these holes the team will have to look outside of the organization. There have already been rumors linking the Yankees with Texas’ Mark Teixeira although the asking price on him may be too high. Other options include Colorado’s Todd Helton, the Angels Shea Hillenbrand, Tampa’s Carlos Pena or Ty Wiggington. Mike Sweeney and Dmitri Young have also been rumored candidates. The Cincinnati Reds have reportedly made Adam Dunn available as well. Dunn is typically an outfielder although he has played 75 games in his career at first base.